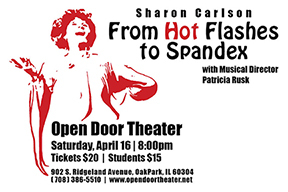 Veteran Chicago actor-singer and Columbia College Chicago Music Department faculty member Sharon Carlson, who teaches singing classes and private voice lessons for students in the Columbia College Chicago Theatre Department‘s Musical Theatre BA and Musical Theatre Performance BFA programs, will star in her one-woman cabaret show From Hot Flashes to Spandex on Saturday, April 16, at Open Door Theatre, 902 S. Ridgeland in the Chicago suburb of Oak Park. 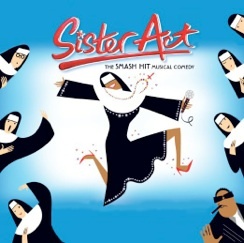 The show starts at 8 PM. Tickets are $20, or $15 for students. For tickets, call 708-386-5510 or click here. 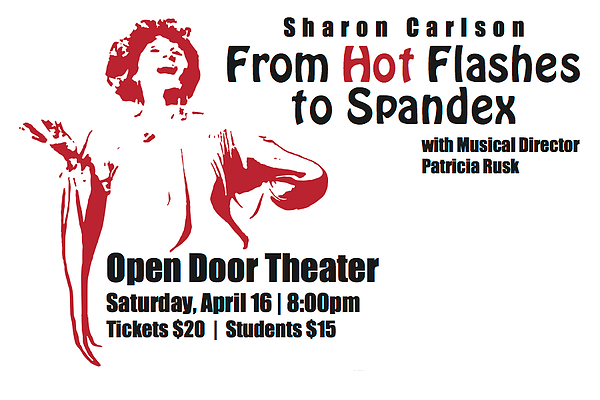 From Hot Flashes to Spandex is described as “an assisted-laughing adventure that explores the path from dreaded middle age to ‘Are you still here?’ For some people the journey from birth to girth might be a depressing travail, but Sharon’s motto is: ‘Keep Singing!’ ” And that she does, in an evening of songs ranging from musical-theatre standards (Stephen Sondheim’s “I’m Still Here,” Kander and Ebb’s “Yes,” Cole Porter’s “The Physician”) to her own specialty numbers (including an adaptation of Bizet’s opera Carmen). Carlson’s credits as a Chicago actor-singer include the musical comedy Summer Stock Murder (for which she won a Joseph Jefferson Award for Actress in a Principal Role), A Little Night Music, Sunday in the Park with George, A . . . My Name Is Alice, Sweeney Todd, The Music Man, Cabaret, Grover’s Corners, and Lost in Yonkers, as well as several solo shows at Davenport’s Piano Bar and Cabaret. 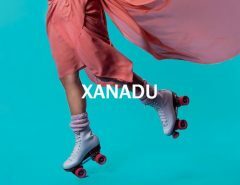 She also served as talent director for the Disney TV show Out of the Box and appears regularly on Chicago’s PBS affiliate WTTW as a pledge drive spokesperson. 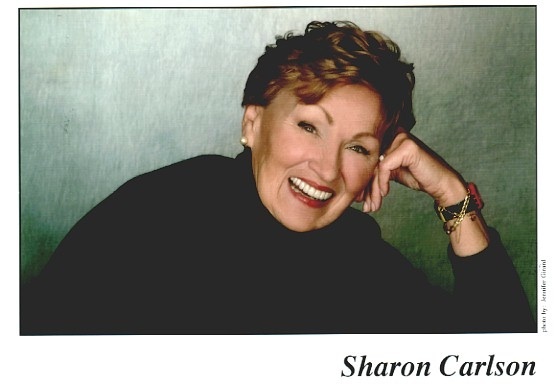 Carlson will be accompanied by musical director Patricia Rusk, chair emeritus of the Musical Theatre Department at the Chicago Academy for the Arts high school.